As a reviewer and technology enthusiast it’s always nice to see a good product get even better. I reviewed the original SPOT Satellite GPS Messenger back in 2008 and was thrilled. It would have been perfect for my trip to Death Valley the previous year, on family camping trips, and anywhere else there might not be mobile phone coverage. So I bought one and it has seen a lot of travel over the past two years. It’s reassuring to know that I can contact help from almost anywhere, and with the addition of their very reasonably priced US $30 per year roadside assistance package, my “help” button will no longer require my friends and family to look at a map and figure out what I might need. For those not familiar with the original SPOT, it has four buttons. Power, OK, 911, and HELP. OK sends a predefined check-in message, along with the user’s current location, to a programmed list of email addresses or mobile phone numbers. HELP either sends a different predefined message or contacts roadside assistance if you’ve purchased that option. 911 sends your current location and a distress message to their International Emergency Rescue Coordination Center, as it did in this case. 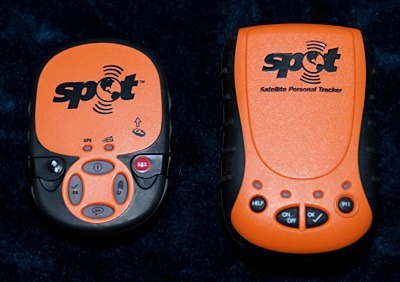 According to the manufacturer, “The new SPOT Satellite GPS Messenger is 30% smaller and lighter than the original SPOT Satellite Personal Tracker, offers additional custom messaging modes, and uses a state-of-the-art GPS chipset and satellite communications to provide enhanced reliability and performance.” While I never considered the first model particularly large, SPOT 2, as many are calling it, is smaller in all dimensions and felt just bit larger than a deck of cards in my hand. Other noteworthy changes are covers over the emergency button (now labelled SOS instead of 911) and the HELP button. Two other buttons, one to transmit an additional customized message, and one to activate the optional $50/year tracking option have also been added. I had the opportunity to test-drive the new SPOT for a few weeks, and like with the previous model, I’m impressed. We didn’t have snow, so I couldn’t toss it in a snow bank like I did while testing the original model, but it’s obviously just as tough, and even easier to carry. And it works.